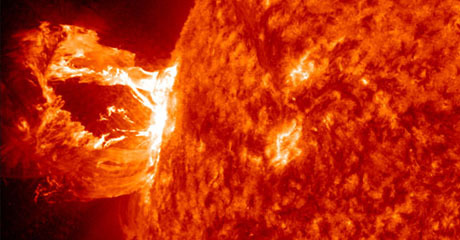 Something big is about to happen on the sun (seen above in ultraviolet). According to measurements from NASA-supported observatories, the sun’s vast magnetic field is about to flip. The sun’s magnetic field changes polarity approximately every 11 years. It happens at the peak of each solar cycle as the sun’s inner magnetic dynamo reorganizes itself. The coming reversal will mark the midpoint of Solar Cycle 24. Half of “solar max” will be in the past, with half yet to come. The reversal will affect the “current sheet,” a sprawling surface jutting outward from the sun’s equator where the sun’s slowly rotating magnetic field induces an electrical current. During field reversals, the current sheet becomes very wavy. As Earth orbits the sun, it dips in and out of the current sheet. Transitions from one side to another can stir up stormy space weather around the planet.